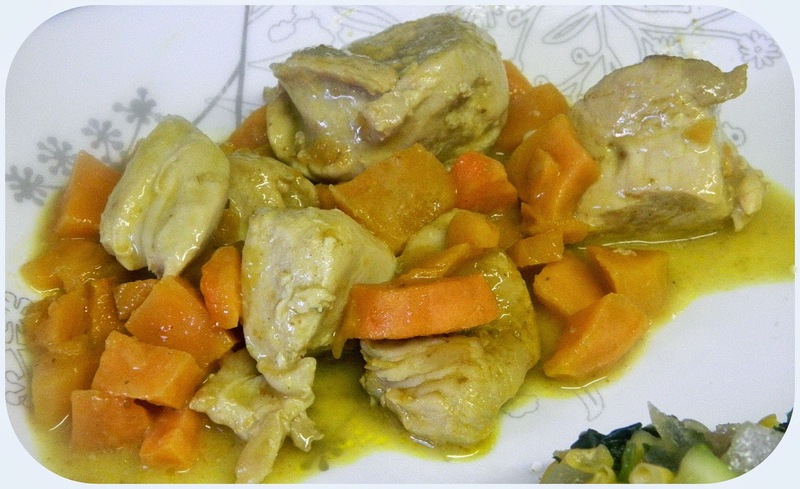 Kayte chose Chicken Poached in Coconut Curry . I had thought about selecting this one also. I am a fan of chicken and coconut, only in certain forms. I do not like a cake with lots of coconut coating the frosting but I love using coconut milk in recipes or added shredded coconut to fruit salads. Chicken is good in almost any form with almost any seasonings. I did most of my cooking for Wednesdays with Donna Hay and Eating with Ellie ahead of time because of the oncoming Jewish holiday of Passover (Pesach). Ask any Jewish woman who keeps this holiday strictly how she feels the weeks before the holiday and I am betting , she will say, "Tired!!!!!!". I enjoy the work but I am exhausted and the blog has to take a backseat to other parts of my life. I did want to keep up as best as I could with the two groups mentioned ahead and I cooked whatever was possible ahead of time. I made this Chicken Poached in Coconut Curry, weeks ago and I don't remember the details but the other members of the group will fill you in. Just check the WwDH website and you will see who is having fun with us and what they are cooking.